Q. Please give me the history of your iron palm training? My Original instructor was Tyrone Jackson who was the senior disciple of Dr Fred Wu. Dr Wu was a senior disciple under Lee Ying-Arng. Lee Ying-Arng was an amazing and great Kung Fu Master from the last generation who eventually lived in Hong Kong. There he was the President of the Inner System Martial Arts Association, President of the Hong Kong Acupuncture Research Centre, and Vice President of the Hong Kong Chinese Martial Arts Association. He was a Doctor of Chiropractic and Acupuncture and studied Wu Tang Kung Fu, Internal Arts and Dim Mak including Dian-hsuhe (Delayed death touch) from many famous Masters. He was a senior disciple under Yang Chen Fu and studied Mind Fist (Yee Chuan/I-Chuan) from Professor Wang Shian-Jie the Founder of I-Chuan. He studied Dim Mak and Dian-hsuhe for over 10 years. In 1968 Lee wrote the book “Iron Palm in 100 Days” that was reprinted about half a dozen times. In that book Lee refers to numerous variations and schools of Iron Palm training and other specialty internal palm methods that he taught and Lee explains how to train several methods of Iron Palm. In his book Lee shows a section of the “Yi Chin Ching or Sinew Changing” classic temple manuscript and he explains that the classic has a section which explains an Iron Palm training method similar to the “straight forward” or Direct method. I began training in Kung Fu in 1979 and I began training with Tyrone Jackson in 1984. One of the first things that Tyrone did was to help me modify the Kung Fu forms I already had and make them much more applicable for Dim Mak striking methods and placement. This included learning the points and meridians and Iron Palm. Tyrone also began teaching me the Iron Palm methods that Lee referred to as the Indirect Method and the All round method and more advanced instruction and other Internal methods not taught in the book but most of which obviously came from Lee because it was a natural extension of what Lee offered in his book. I also found out that parts of the book are intentionally misleading or only taught in part to stop people from fraudulently capitalizing on Lee’s work. We were also taught simple ways to make our own training equipment from readily available items such as Phone books and duct tape. I trained external methods at first. ,,,in part because the more advanced Dim Mak, Dian-hsuhe and Chi Manipulation including healing methods can only be gained and mastered with the internal methods. Tyrone demonstrated these skills from the first day I began studying with him. I was particularly impressed with his ability to affect people from a distance and healing without touching methods. Q. What are the similarities with other iron palm styles? The main types of Iron Palm that the general martial arts public seems to be familiar with involve training with materials and liniments. From the practitioners I have spoken with and articles I have read the external methods we were taught are very similar to what I understand most other practitioners are doing with minor differences. As for the internal methods without materials I have not met many people in North America who are familiar with this method at all let alone training in it. Q. How long have you been training in it and what attracted you to it? I met Tyrone in a park in 1981. At the time I was training in some other martial arts and although I already had some limited training in Tibetan energy methods I was really intrigued. About this time my dad recommended that I look for a Kung Fu teacher to continue my training and I would have gone back to Tyrone but I did not know how to find him and he only taught small groups, privately and at his home. I started studying Dr Wu’s system of Kung Fu in 1982 from one of Dr Wu’s other senior students and then I began studying from Tyrone in 1984. As a result I began training Iron Palm in 1984. I was not really seeking out Iron Palm. I had not heard enough about it to actively seek it. Iron Palm and Dim Mak were simply a part of the Kung Fu training we received. Once I began training I was hooked on it for awhile and then when I saw the other skills that could be acquired I began to get more interested in Internal energy training and development and I have not looked back since. Q. From whom did you learn? Over the years I have been fortunate and blessed to learn from quite a few teachers. However, my original and primary teacher for Iron Palm was Tyrone. Q. What kinds of advice did your iron palm sifu give you? One of the interesting things about training with Tyrone was that he almost never had us break materials. About 1986 I decided on my own to break a concrete block. So, I put this patio block on top of two other strong and sturdy cinder blocks and proceeded to try to break it. I hit it multiple times and got nowhere. It felt like my hits were penetrating all of the way through but no break. Finally, after a few days of this I became very frustrated. One of my class mates comes over to my house and looks at the 2 support bricks and moves the top brick off of them. Both of the support blocks had fractures lines running through them and when picked up they fell apart with a very light slap while we were holding them. I immediately went and asked Tyrone about this. “Don’t break, Just Keep Practicing”. I then realized that he was teaching me vibrating palm and how to transmit the energy through objects without damaging the surface. I got really excited and we were in the process of tearing down an old little 3 room guest house that was sitting in our back yard. I began striking the tiles on the house to see how far I could project. At one point I hit the front of the house and broke a window on the back. I then began using the house to see if I could make the energy travel in the direction I intended and I was able to gain some skill at it. I still broke on occasion but I did get the idea that he wanted to train our hands to be able to project so well that one blow would have devastating consequences if we ever had to use our art. Today I only break to test things out or when I am giving a demonstration or if I am teaching a very specific skill where the student needs to see what is expected. I believe as Tyrone did that this is much better for long term health. As for using our Kung Fu in a fight Tyrone subscribed to the idea that we should never try to hurt people if it could be avoided but he was very aware that we lived in a very violent and crime ridden industrial city where the chances were high we would have to use our skills for survival. Over the years I lived there, I was attacked on the street more than a dozen times including knife and gun assaults. Most of the time I did not have to hit people but when I did hit them they went down within the first second or two of contact. Q. Describe the curriculum for beginning, intermediate and advanced students. This interview was conducted before our Tai Chi Internal Iron Palm video was made. The curriculum that Sigung Clear describes below is contained within our Kun Tao Silat program. It is a bit different from the training progression found on the Internal Iron Palm in 100 Days: Secrets of Tai Chi Iron Palm video. Today I teach primarily internal methods so the curriculum is based on what the students need to attain high quality internal methods and there are quite a few levels from beginner to very advanced. …are all taught to beginners. These are practiced and refined all the way through the program by even the most advanced students. Internal sensitivity training begins with the Push Hands but by the time the students are at an intermediate level it is expected that they can feel the internal energy movement within the Ba Gua exercises and Shaolin or Tai Chi sets also. At the next level students are taught Whole Body Power, Heavy Hands and Body, Compression Hitting, a very powerful but basic series of 1 Hit/Touch Knockouts and Iron Body which includes Iron hand and forearm. Then students learn a fighting method for delivering multiple Iron Palm/Kilap Slaps very rapidly. Generally speaking they can throw 3 – 5 of these hits per second and train to sustain it for a minimum of several minutes at a time. It makes for an amazing offense and defense all in one. There is a little breaking of wood to make sure that development and ability are appropriately developing and students have to demonstrate a basic proficiency level before progressing. At the next level students begin Lao Gung development. Also, students learn how to focus and condense Chi and energy flow. They train Internal Iron Palm and Poison Hand specifically as well as the Whip hand and fighting methods that generate strikes from the legs and spine out to the hands. Students also learn how to evade Iron Palm strikes while still landing their own hit(s) and how to internally and externally redirect the energy of energetic hits they receive so that if they are hit they can mentally redirect the energy back out of their body and not be vitally damaged. At this level there is more wood breaking. Students must break boards with whip strikes using their finger tips. and break it with their other hand. Intermediate Methods include (but are not limited to) penetrating palm, crushing palm, vibrating palm, short distance hitting, introductory no-distance hitting, the transference of shock power hitting and utilizing the lao gong to energetically hit. Skill tests include being able to hold two boards in one hand and break them both or only break one of the two boards, as chosen by the instructor, with their other hand. So, in reality they have to be able to break either one or all of them by choice. Also, by now brick breaking is tested and the student has to break at least one brick. The average student has the power/ability to break a brick prior to testing for it at this level but I do not rush brick breaking in accordance with what Tyrone taught me. Advanced methods include (but are not limited to) cotton palm, springy palm, fire hands (burning palm), Advanced No-distance hitting and universal energy palm. Also included are learning how to use a Yin palm to take energy out and the Yang palm to put negative energy in to someone. 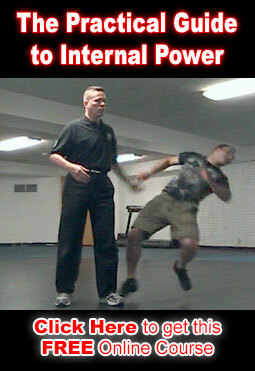 Also the delayed death touch and other advanced striking methods are in the advanced curriculum as well as more advanced methods of energy transference including being able to strike a person almost anywhere and have the strike travel through the opponent’s body to an intended destination somewhere else inside them. Healing methods for many of the energetic strikes are included. Skill tests include being able to hold three boards and break them all or only break any one or two together of the boards as chosen by the instructor and being able to break bricks and get different effects with the brick breaks. There are other skill tests as well such as being able to lightly hit through a very thick force shield pad and have the person who is holding the pad feel the hit as if the pad is not there. I have some police officers for students and have demonstrated this hit through a bullet proof vest. I also have a method that is taught as part of our advanced Tai Chi curriculum that includes Internal Iron Body, Cotton Palm and high level Dim Mak including being able to hit anywhere on their body and have your blow go where you want it to as well as how to touch the opponent very lightly (or so it seems) and transmit a tremendous amount of damage to their spine and central nervous system. One of the tests for this involves the use of a thick phone book. The receiving student holds the phone book over their belly and the striking student hits the phone book and their palm print has to appear on the receiving student’s belly. Healing methods for many of the energetic strikes are included. Once you learn how you actually practice the strikes and healing energy and methods for these by practicing the Tai Chi set and Push Hands which makes it sound simpler than it is because it is quite a bit to learn and it takes a lot of work, patience and diligent practice while you are being guided/advised by a competent teacher to get it right. Q. Do you do anything differently than other systems who teach an iron palm method? I have not met anyone else in the United States who trains their Iron Palm in the manner and progression I have described to you above. Q. How do you keep young or beginning students from doing permanent damage to their hands? Our training method described above is designed specifically to avoid this from ever being a problem while giving the practitioner Internal Iron Palm and energy skills that they can use for the rest of their life. Q. How long does it take to master your system? Specific aspects and methods of training in isolation can be mastered quite quickly. However, the full curriculum requires many dedicated years of training to complete. Q. What kind of jow do you use and what is the history behind it? Lee sold a personal family recipe liniment appropriately called Lee’s Liniment that was advertised in many of his original books during the 1960’s and included in subsequent printings all the way up until at least the 1980’s. We used this liniment for any bruises we got and also for Iron Palm training. When we practiced the Indirect method and Internal Iron Palm Tyrone would have us put a few drops on our hands and massage it in to cause the energy to flow to our hands. In years since I have used a number of products including Oriental Herb Company products. For a lot of the specialty palms no jow or special herbal treatment is required and what is lot more important is Chi Kung training and practice which includes taking care of yourself, getting proper rest, eating nutritious foods and taking vitamins etc. to take care of your body and mind. Q. What is the need for iron palm training today? An aspect of Iron Body, Internal Iron Palm and some of the specialty palms that is often overlooked or not understood is that they are a byproduct of Chi Kung that is designed to make your body super healthy. As for self defense these methods are phenomenal. There are many places in our society today where you can not carry a weapon such as a knife or gun. Iron Palm is a great equalizer against an attacker who is much larger and stronger than you. Also, if you are attacked by multiple attackers it is a really nice benefit to only have to hit any attacker only once so that you have a real chance of escaping and living through the situation. I practiced Iron Body and Iron Palm for over an hour every day for over 6 months before I opened my first school in 1990. I did it with the idea that if I got seriously challenged by someone who just came in the door and attacked me that I could take a very serious hit from them and give them a hit that most people could not withstand. Amongst other things it gave me a confidence that helped alleviate some very serious situations in my early years of running my own schools. I teach a 2 day course on the 1 Hit Knockouts combined with scenario training to executives and business owners including their wives and family members. About a dozen graduates of the course have had to use the training in a real confrontation where it became physical. In every case the attacker was either knocked out or incapacitated in some form and in the case of one attack the attacker got their arm broke on first contact. I teach students to first get away if they can and then to put up a deterrent that most attackers respond to in exactly the manner we want which is for them to back off. We have had over 60 graduates of the course report that they were able to stop a violent encounter before it became physical by utilizing this aspect of the training. When the attacker physically attacks anyway and vastly out muscles and towers over the defender or when the attacker is one of several or more then the kind of force imparted through a 1 Hit Knockout/Iron Palm type strike is very justified. Once the attacker has been dropped or nullified then the student immediately discontinues and gets away as fast as possible in order to call the police from a position of safety. There is no being overly easy on an attack from a hardened criminal who is under the influence of drugs. It is a pipe dream to think someone can use a limited and rationed amount of force and come out okay. Use as much avoidance and deterrence as possible and when this fails due to an attacker’s determination to get you then drop them as soon as possible. As a side note for the socially and legally conscious readers out there I have taught the program to a number of attorneys who tell me this is the smartest judicial use of force they have seen while still physically fully protecting the law abiding person who is forced to defend themselves in a bad situation. The Iron Palm training described in this article is contained within the Clear’s Kun Tao Silat Curricululm. We also have a video that was produced after this interview that focuses only on the Internal Iron Palm methods found in Tai Chi Chuan. fascinating! i have considered ordering the book LEE had off amazon used books , generally about 70$ for a copy. we do have the pa kua chang for self defense and have seen the linament ads there. right now we are using chu kiang linament and making a batch from shaolin recipe soon. i do have decent herbal skills. we also use an internal formula. but i am just getting started on this. the mung bean bags seem useless? i am using a 6 inch thick cedar log with 4 cuts in it as a makiwara. i use backhand, chop hand.fist,palm, and 2 finger and all finger > like a bird beak. strikes 60 each. both hands.